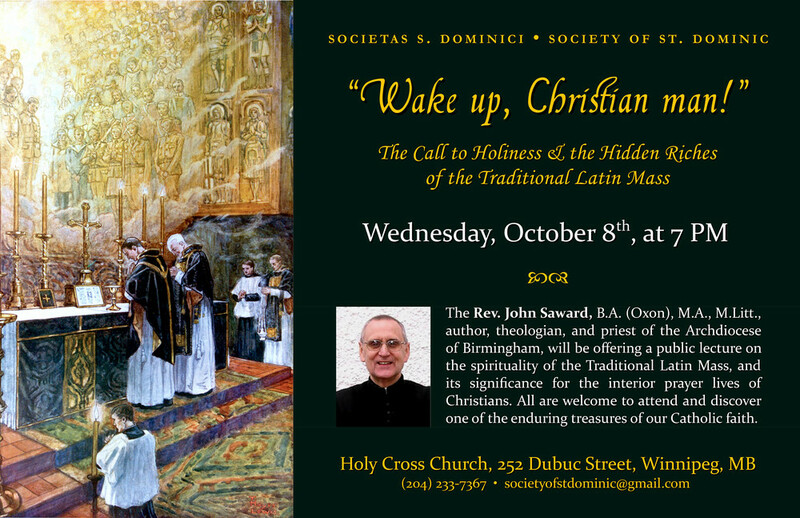 The Society of St. Dominic is pleased to announce that Fr John Saward will be giving a public talk at St. Ann's Church in the Archdiocese of Winnipeg on Thursday, October 9th at 7:00 pm. Please join us on Wednesday October 8th, 2014 7:00 pm at Holy Cross Church for a public talk by the Rev John Saward. "Wake up, Christian man!" The Call to Holiness & the Hidden Riches of the Traditional Latin Mass is an examination of the connection between the interior life of Catholics and the ancient prayers of the Extraordinary Form of the Mass. Those experienced in assisting at the Extraordinary Form of the Roman Rite as well as those unfamiliar with the older form will find this talk invaluable for deepening their devotion both at Mass and afterwards.